Matt Rokus, deputy chief of police, (left) issues Eau Claire police officer Mark Vang his load-bearing vest. 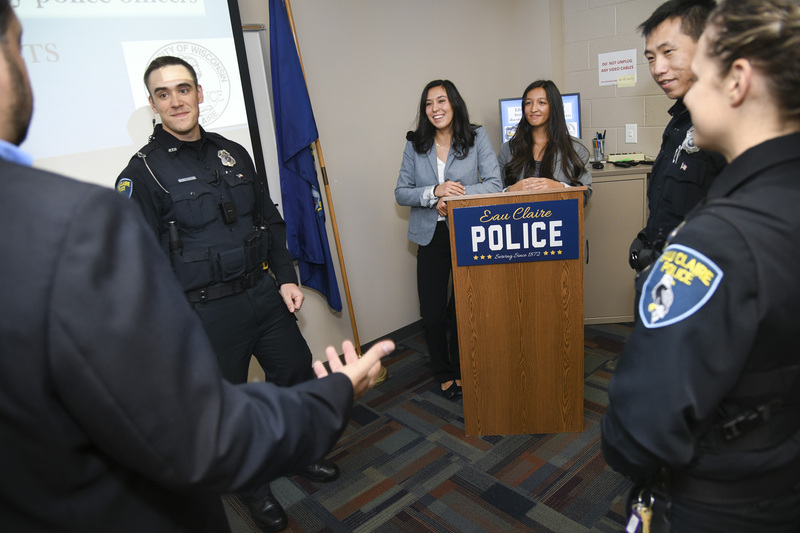 Fifteen Eau Claire police officers volunteered to be part of the university’s study. For three months, some officers wore load-bearing vests while the others carried gear on the duty belts. The officers wearing belts then switched to vests, and those wearing vests went back to belts for three months. The 15 officers who participated in the study already have been issued their vests and began wearing them immediately. 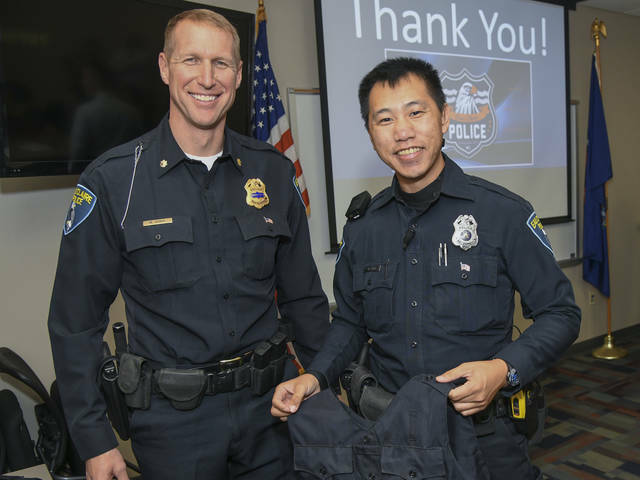 The research partners in the study — UW-Eau Claire, the city of Eau Claire and Mayo Clinic Health System — shared the costs of the 15 vests being used by the officers who volunteered to participate in the research. As funding allows, the ECPD will purchase additional vests so every officer will have one, Rokus said, noting that vests cost $300 each so it will take some time to purchase them all. 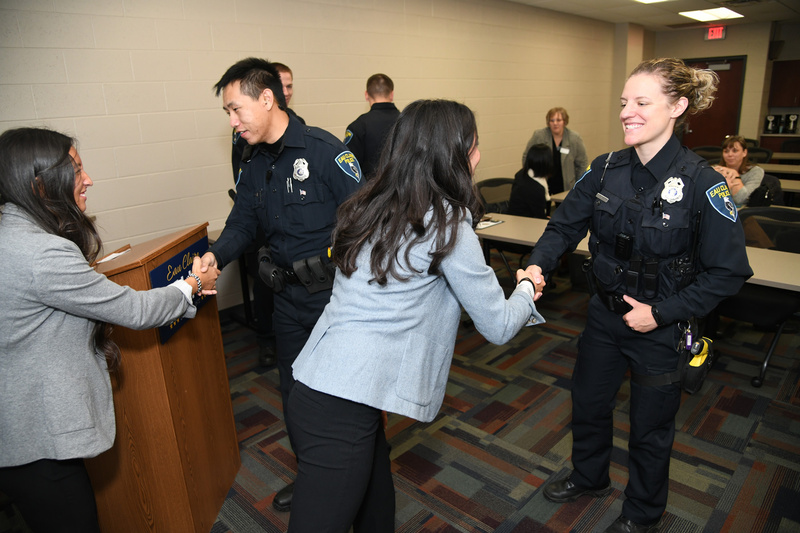 Bougie said it’s incredible to know that her work as a student researcher will make a positive difference in the quality of the lives of police officers here and elsewhere. UW-Eau Claire faculty involved in the vest research include Janot; Dr. Nick Beltz, assistant professor; Dr. Saori Braun, assistant professor; and Dr. Marquell Johnson, associate professor. Student researchers include Bougie, Anna Kohler, Sierra Freid, Maddy Downing, Jessica Nagel and Lindsey Opelt. Dr. Andrew Floren of Mayo Clinic Health System helped UW-Eau Claire researchers design the study. For more information about the police vest research, contact Dr. Jeff Janot, professor of kinesiology, at 715-836-5333 or janotjm@uwec.edu, or Matt Rokus, deputy chief of police, at 715-839-4979 or Matt.Rokus@eauclairewi.gov. For information about The Vest Man company’s hybrid vest carrier vests that were used by officers in the study, contact John Gurrola at 310-864-1567 or by email at john@thevestman.com. Judy is the IMC’s chief storyteller, sharing stories about the many exceptional people that make UW-Eau Claire such a phenomenal place. She talks with students, faculty, staff and alumni to find and to share their successes, initiatives, challenges and dreams with the campus community and the world beyond.